Hard drives on 1.8” platters have been in deficit for a long time. That's mostly Apple to blame here. To avoid competition to its beloved iPod (as this manufacturer is usually hard pressed in fair competition), this company bought almost all these products, taking advantage of the agreement with Toshiba (who launched hard drives of this format on the market). But deficit cannot exist in market conditions for a long time — Toshiba increased its production volume, Hitachi joined it, so the amounts of such hard drives on the market grew considerably. As a result, we can witness mass announcements of MP3 players based on these HDDs, they also penetrate the other, less profitable market segments. Such hard drives can now be found in portable storage devices more and more often. I guess I don't need to explain the benefits to you: such models are definitely more compact than their larger counterparts, they consume less power, which may also be important. There are some disadvantages — 1.8" hard drives have a smaller maximum storage capacity than their larger counterparts (2.5” hard drives have reached 120 GB already, while the compact models can offer only 60 GB, modifications with the largest storage capacity being still in deficit); the tiny models are noticeably more expensive than their larger counterparts with the same storage capacity. On the other hand, most users don't want a large storage capacity from a portable hard drive — popular 20 GB or especially 40 GB are more than enough to carry rather large volumes of data, which makes these storage drives nice competitors to rewritable optical discs. Their prices have reached an acceptable level. Of course, a 2.5” 20 GB storage device will be much cheaper (you may keep it within $70, if you assemble such a device on your own), but many users are ready to pay for better usability. Unfortunately, the choice of such portable storage devices is not rich even now. Up to now, we have reviewed only three such models and a half (one and a half is LaCie Data Bank - it may have a combined interface, or only USB 2.0). One of them demonstrated very low performance due to its poor controller, so we could recommend it only when customers had no other choice. That's why each model on the market is very interesting and original. 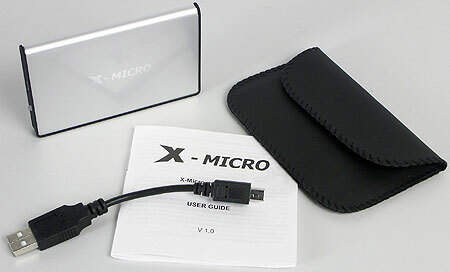 Today we shall add another portable hard drive to our list of reviewed models — X-Micro mini DisGo. This storage drive is the most compact model we have ever seen. The design is rather simple (unlike LaCie Data Bank), like in Transcend StoreJet. But it's smaller than the latter: 8.5 x 60 x 98 mm versus 15 x 71.5 x 95 mm. That is this storage drive is a tad longer, but 1.5 times as thin and a tad narrower. The first analogy that comes to mind is a PCMCIA expansion card :) We have to hand it to this model, you will hardly manage to break it, despite its thinness (of course, if you don't do it intentionally) — the housing is not plastic, but aluminum, made of a one-piece U-bent sheet. Three faces are plastic, but they have no effect on the resistance to environment conditions. For all this, the device is very light-weight — just 85 grams, while its competitors weigh over 100 grams! Of course, it's about twice as heavy as storage devices with micro hard disks, but the capacities are very different as well — even tenfold rather than twofold. Or they may be the same — the series includes a 5 GB model. Why? The price may be quite interesting in this case — players and other consumer electronics don't use such hard disks already, so the manufacturer might have sold the remains quite cheap. Its compact dimensions are comparable to the tiniest portable hard drives (in my subjective opinion, mini DisGo is even more convenient to carry than a thick and round Seagate USB 2.0 Pocket Hard Drive), so... I see no reasons to overpay ;) Storage capacities of the other three models are more typical of this class of storage drives — 20, 30, and 40 GB. We tested the 20 GB model. That's how it's detected by an operating system. We can see the HDD model — MK2006GA. LaCie Data Bank, tested a year ago, used an older model from Toshiba — MK2003GAH. So we can assume that performance of the new model will be higher. Well, we are going to test it a tad later. There is nothing more to say about the exterior. We can just mention that one of the short faces houses a standard USB mini-B jack and a two-color LED activity indicator. The only thing you may miss is a Windows 98 driver. We have no choice in this matter: even Microsoft itself recommended that manufacturers should discontinue support for this operating system. Under less fossil operating systems, everything works fine without any additional software. We used HD Tach 2.61 and AIDA32 3.93 (to be more exact, some tests included into these utilities) to measure operating speed. From the first program we took only results of the access time and the peak throughput tests, read and write speed measured in this program cannot be taken into consideration - these results have little to do with reality. In AIDA32 we used three tests: access time, linear reading and linear writing. I limited myself to these tests only, in order to save time and article space — I don't think that any sane user may be interested in the results of these storage drives in productivity applications (especially as we have already determined that USB is not a good choice here, irregardless of a HDD type) :) In most cases, external storage drives (especially compact) are bought for storing and transporting data. Notebook owners often keep their work files on such drives, mostly if access speed to them is not critical. So I see no point in crowding our material with dozens of diagrams, needless to 95% of users. Theoretically, even normally implemented USB 2.0 (to say nothing of FireWire) will do for modern small hard drives. That's why this test is used for determining whether a given controller is normal. In other words, we check for the Archos ARCDisk situation, when a bad controller bungled the advantages of a fast hard drive. In this case, it won't happen, so let's proceed to more practical tests. Average access time of our model under review is about 2 ms shorter than in previously tested storage drives. It's not much (about 10%), but still good. However, hard drives still cannot compete with the majority of flash drives in this aspect and never could. Like we have assumed, mini DisGo easily outperforms LaCie hard drive in read rate, but it cannot overcome a Transcend storage drive. However, 20 GB and 40 GB hard drives differ from each other significantly, so this difference can be written off to it. We don't know what model would have been faster, if StoreJet and mini DisGo had identical capacity. Anyway, the difference is not critical — it's detected only in tests. The situation with the write rate is the same. The results of mini DisGo are remarkably closer to those of StoreJet rather than to Data Bank. However, the difference between all the storage drives is very small — in case of large files (many users buy portable storage drives for transporting movies and CD images) you can count on more than 10 MB/s, no matter whether 12.5 or 15 — so it will take a minute to copy a standard 700 MB CD. We've been reviewing X-Micro products regularly for two years already. I have grown tired of answering the questions where you can buy these models. The fact is these devices very often look attractive (this manufacturer produces damn good products), but deliveries to Russia had been up in the air for a long time. Fortunately, the situation has changed and many models can be found in Moscow retail. But unfortunately, mini DisGo is not yet available here (at least when this article is written). Let's hope you'll be more lucky and all the four models will be available (or at least some of them), when you read this article . The miniaturization process works in all spheres of the computer market, slow but sure. Hard drives are no exception here: we already said good-bye (most likely for good) to hard drives with 5.25” platters; their 3.5” successors are pressed by smaller hard drives, which already invade sancta sanctorum — server applications. The intended upgrade of portable storage devices from 2.5" to 1.8" looks logical here. Higher prices and lower availability of compact models are the deterrents here, but the ice broke up . The appearance of such models as X-Micro mini DisGo may accelerate this process: outstanding compact dimensions with good performance and rather high storage capacity will hardly leave you untouched. In fact, a user in need of "a means of conveyance" for dozens of gigabytes does not have to think hard where to put it in this case. Hence our Original Design award. Unavailability of this storage drive on the Russian market somewhat spoils the impression. On the other hand, it's quite a new device and maybe it just hasn't reached retailers yet. What's important, X-Micro products have started to appear in Russia. So if you want to buy a compact portable storage drive, your wish will most likely come true soon.